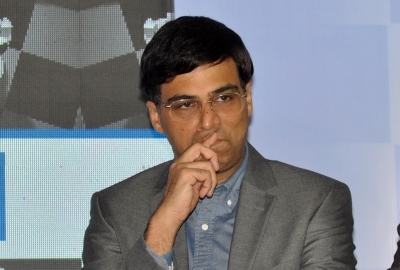 Kolkata Sep 15 (IANS) Five-time world champion Viswanathan Anand will be the star attraction at the Tata Steel Chess India rapid and blitz tournament to be held here from November 9-14. Anand 48 said here on Saturday that he would return to the city to play in a GM competition after a gap of 32 years. "I remember playing my first GM tournament in Kolkata in 1986 -- that was also a Tata Steel event here. I was an International Master then " Anand said during the announcement. "I have played occasionally in India. But to have fellow top 10 players here I am very happy and excited to be part of it. It will be a super tournament. "I hope this tournament will revitalise chess in India. We now have a lot of chess fans in India who follow chess but its always happening somewhere else some other time zone. This will be an excellent chance for them to come and enjoy like when the World Championship happened in Chennai a lot of people saw an event live. This will be the same thing " he added. The USD 40 000 prize money tournament will feature three top players in the 2800-plus Elo rating it was announced. The top players include Azerbaijan GM and world number three Shakhriyar Mamedyarov Armenian GM and world number six Levon Aronian the USA s GM Wesley So who is world number 9 Japanese-American GM and four-time United States champion Hikaru Nakamura who is world number 14 and Russian GM Sergey Karjakin (world number 15). Anand regained some form at the Sinquefield Cup that ended in August in St Louis US. The first Indian to become a chess GM Anand went undefeated in the tournament though he did not manage any wins either and finished sixth out of 10 participants. Apart from the Indian chess wizard the Indian GMs include P Harikrishna Surya Sekhar Ganguly Vidit Gujarati Nihal Sarin Rameshbabu Praggnanandhaa as a total of 11 top-ranked players will compete in the meet at the Indian Council for Cultural Relations.